Vancouverites have been waiting a long time to see members of the Canucks in a parade down Robson Street, and on Sunday, they finally got their opportunity. 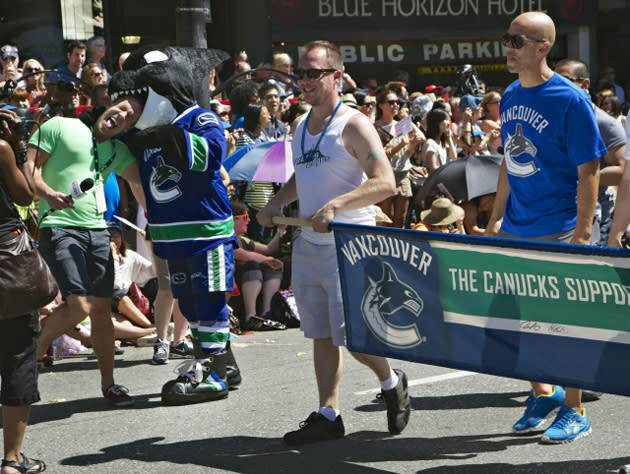 Vancouver Canucks player Manny Malhotra walked side by side with members of the Vancouver Cutting Edge, the only gay hockey club in western Canada. On his wing were a fleet of photographers as well as Patrick Burke, founder of the You Can Play organization, dedicated to eliminating homophobia in sports. "It's paramount that equality in sport, and beyond, becomes the norm. Everybody has the right to play the game they love," Malhotra said. He joins teammates Ryan Kesler, Henrik Sedin and Daniel Sedin to become the fourth Canuck to lend his support to You Can Play. Of note: That's probably the closest the CBC will get to the Hockey Night in Canada theme song ever again. Fin, the Canucks' mascot, won't get nearly as much attention in all this, but his involvement really puts things over the top for the Canucks. This wasn't just a few players deciding to go on their own (although they were hardly coerced); this was an organization sending out a full delegation, making a statement against intolerance in sport as a franchise. It's a bold, unprecedented step by the Canucks, and one I hope other sports franchises have the guts to follow.